What brand and model machine and quilting frame will be used? The most anticipated innovation in quilting has arrived. What is QBOT? QBOT stands for 'Quilting Based on Technology." It is a new, totally computerized quilting system. Why pay someone to create a professional quilt, when the QBOT can do it for you? The QBOT offers professional results…easily and automatically. Simply put, the QBOT does everything for you. Automatic hands-free movement creates the perfect design that would be impossible to do by hand. You are now the professional! Just think about all of those quilting projects that you started, but never finished. 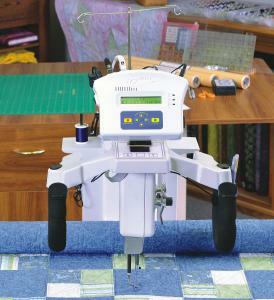 The QBOT will complete your quilting projects in a fraction of the time. Design more intricate quilting than you ever imagined. With more than 18 quilting designs included, you can start creating beautiful designs immediately. If you prefer, you can “record” your very own one-of-a-kind pattern and repeat it the same way, or shrink it, anywhere you want on the quilt. Take pride in professional results, the easy way. Own your QBOT today! QBOT V3 is our newest product - available for purchase as an upgrade to earlier firmware versions of QBOT or as a new-in-the-box complete unit. Many design features are built into the interface, like Design Management, Line Quilting, Mirror Image, and Nesting; as well as improved features you're already acquainted with like Pattern Quilting, %Restart, Another/Chain, and Overlay. QBOT V3 requires an Android-based tablet with Bluetooth®. With the many Android options available on the market, you'll be able to get the screen size which best suits your needs (NOTE: our beta testers highly recommend 10" models). The benefit of the tablet interface is that the QBOT will never go out of style. As new tablets come out with new features, you can always have a fresh look to QBOT - it's your choice. QBOT does it for you! Automated quilting at your fingertips! Quick set up and easy learning curve! QBOT leads you step by step! Even difficult designs are easily stitched! Automatic adjustments for rotated or skewed blocks! Enter the rotation angle and QBOT does the rest! 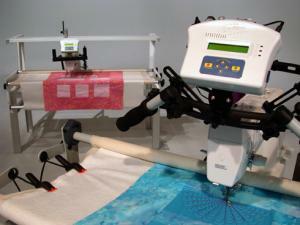 QBOT automatically records your free-motion quilting! Machine quilting and embellishing have never been easier! Quilting frame-compatible drive wires and frame mounting hardware. 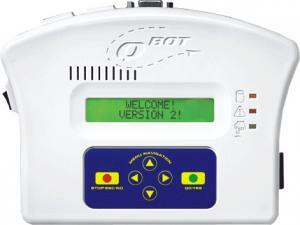 Could you please confirm that the QBot is compatible with the Janome 1600P DB. Also would it be wired for Australian electricity conditions? 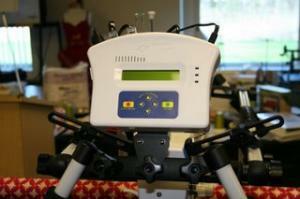 The QBOT will work in Australia with the janome 1600 series sewing machines. There is an additional fee of 40USD for the approved version for Australia (for electrical standards and overseas power adapter).